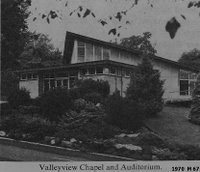 Links to many blogs, and information about the many groups that use the Riverview Hospital site in one way or another. Click on the building names. Shut down in 1986. Was used for a while by the movie industry. The oldest building on the site at this time. View a photo set of West Lawn at Flickr . Check out the WEST LAWN blog, for more information, especially the historical aspects. Check out the HENRY ESSON YOUNG building blog, for more information. Check out the PENN HALL blog, for more information. 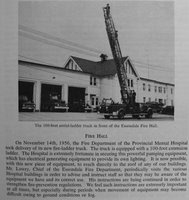 ( 2013 building condition assessment report, PDF ). Check out the CREASE CLINIC blog, for more information, especially the historical aspects. The Pharmaceutical Distribution Centre,(PDC) moved into the old pharmacy area in 2007, while there off-site building was being renovated. Shut down in 2007. Now abandoned. In 2013 being used by the movie industry, who painted portions of the front. The Bakery now sits abandoned. The largest part of it is constructed of cinder blocks. These buildings have seen many changes through their years. You can clearly see at least three alterations in the first image on the right. 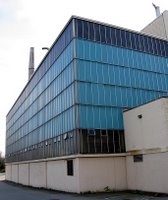 The blue panel and glass structure was built in 1971, when the conversion from coal to gas/ oil firing occurred. Apparently, Ken Varma 604-482-7002 Cell: 604-315-5227 ken.varma@wsi.brookfieldjci.com is the contact person. FERNWOOD LODGE - NURSES’ HOME #2 1937 AKA " Cinder Hill "
Society for Community Development and PLEA a group that mentors young people in trouble. This is one of the small complex of buildings associated with the Transport department. Built at various times. Today it is used by the Dentistry department, and as offices for grounds security, which today is contracted out to Paladin Security. The B.C. Sheriffs Service has been using Leeside, since their fenced parking compound, was created from the parking lot, between Leeside, and Brookside. 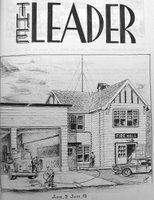 Today this building is was used by the Sheriffs, they moved into North Lawn, then into Leeside, and by the, Society for the Preservation of Antique Radio in Canada SPARC A really interesting radio museum. 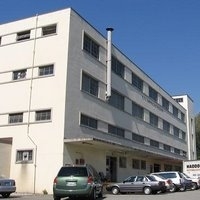 The bottom portion is used by the British Columbia Buildings Corporation,BCBC. Also the Rotary club uses a portion, of the lower floor. A separate volunteer organization that is associated with Rotary International, operates from the beasement of this building, known as Rotary World Help they gather up medical equipment and supplies and ship them in containers around the World to the needy. B.C. 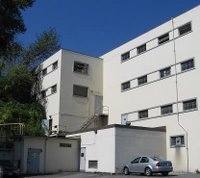 Ambulance Services Station 259 is also based out of this building; they are using the portion on the far right, at the back of the building in the photo. Entrance to the SPARC museum is to the right, under the covered area. This is for the emergency use of the boiler House, in case the natural gas supply is interrupted. The little cinder block shed-like building on the far right. Located in the Serenity Garden. It is usually locked, because of vandalism concerns. 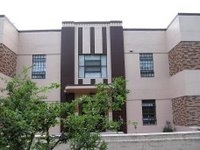 Visit the Home for the Aged-Valleyview blog, for more information. 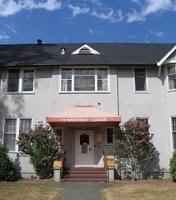 Tri-Cities Home Health , which is a division of Fraser Health use this building today. Is not used for Hospital use anymore. But the Police and Fire departments, use it for honing their skills. One of the main electric feeder stations for the grounds. Most of the wires are underground at Riverview, which noticeably reduces the visual impacts, of overhead wires. 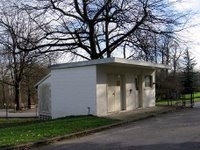 A tiny little building, used to store the equipment used to inter people in the Cemetery. The Cemetery is divided into different sections for the differing theologies. Pauline Verral; Hospital Health Records. 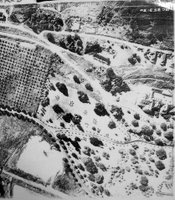 Stated that the first recorded burial in the Riverview cemetery is dated January 10, 1958. Slowly starting to photograph the grave markers and create a database which will enable researchers to find the folks buried there a little easier. that resided under the care of the museum until the hospital totally shut down. Some families took care of funeral arrangements while those that did not have any family or family burial plots were buried by the Provincial Government in unmarked graves in the City of New Westminster's public cemetery; Fraser Cemetery, on 100 Richmond St. from around 1908 to early 1920. There may be some patients who were buried in the Cemetery on Robinson Ave in Coquitlam. The B.C. 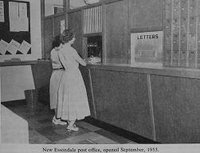 Archives recently added a genealogy part to the vital statistics pages, images of the original documents are included in many searches" Here is a search using the term Essondale over 9,000 hits. 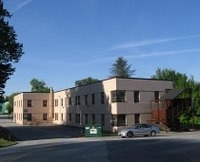 The block building to the left, along with the container were used to store PCB contaminated materials at one time. The building to the right is used to store painting supplies. 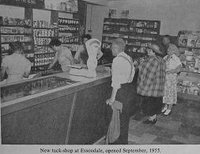 But on May 5,1955 a fire broke out with almost total destruction. 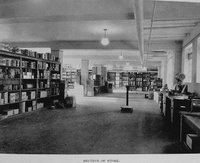 The loss was great, and the industrial therapy departments, were distributed around the grounds in any unused space that they could find. The only one building on this site, still survives from before the fire, and that is a garage, ca. 192?. 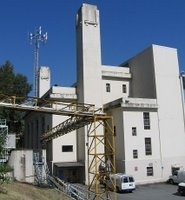 The building was eventually replaced when the Industrial Services building was built in 1961. 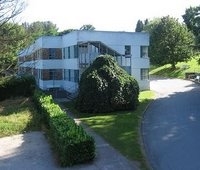 There are also a number of individual residences on the Riverview site, which were built to house administrative and working staff. The surviving staff residences are mainly clustered in three groupings; there are also some interesting landscape features that exist in conjunction with these houses. 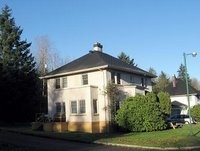 A two storey stucco-faced residence, with a hip roof, central chimney, multi-paned windows, and a projecting front Day. In good condition; currently used by Forensic Services. ( 2013 building condition assessment report, PDF ) More pictures of Cottage 103 can be seen at Flickr. Unlike many of the other residential buildings, it is clad with wide lapped wooden cedar boards. In good condition; currently used by Forensic Services. 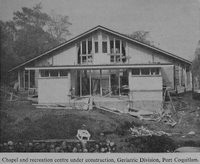 More pictures of Cottage 104 can be seen at Flickr. A two storey stucco-faced residence, with a side entry porch, a hip roof, multi-paned windows, and a projecting front bay. In good condition; currently used by Forensic Services. ( 2013 building condition assessment report, PDF ) More pictures of Cottage 105 can be seen at Flickr. A one and one-half storey stucco-faced residence, with an inset side entry porch, side jerkhin-headed roof, and a jerkhin-headed dormer. The plans were signed by Henry Whittaker as Acting Supervising Architect. In good condition; currently used by Vocational Services. ( 2013 building condition assessment report, PDF ) More pictures of Cottage 106 can be seen at Flickr. Cottage 106, on the right. Cottage 107 on the left, Cottage 109 barely visible far right. A two storey stucco-faced residence, symmetrically massed, with a central entry porch, and a hip roof. More pictures of Cottage 107 can be seen at Flickr. More pictures of Cottage 108 can be seen at Flickr. A one and one-half storey stucco-faced residence, with a full open front verandah, side gable roof, central entry, and paired semi-octagonal front hip dormers. The entry leads directly to a central open staircase. The original front porch columns have been replaced with new steel columns. In good condition; currently was used by Pastoral Services and the Volunteer Department. Today, used by Coast Cottages, for forensic patients. ( 2013 building condition assessment report, PDF ) More pictures of Cottage 109 can be seen at Flickr. ( 2013 building condition assessment report, PDF ) More pictures of Cottage 110 can be seen at Flickr. Was used by the Mental Health Law Program. 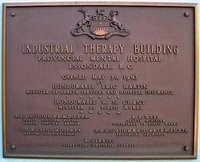 In 2007 it was being used by Coast Mental Health, for Forensic patients. 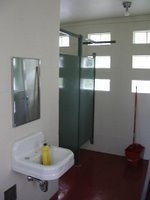 More pictures of Cottage 111 can be seen at Flickr. A one and one-half storey stucco-faced residence, with a full open front verandah, square columns, side gable roof, offset entry, hip front dormer, and rear hip wall dormer. In good condition; was used by Occupational Therapy: The Green Door. Today used by Coast cottages, for forensic patients. ( 2013 building condition assessment report, PDF ) More pictures of Cottage 112 can be seen at Flickr. A one and one-half storey stucco-faced residence, with a hip roof, central chimney, multi-paned windows, and projecting front bay. In good condition; was used by Legal Aid; today used by Coast Cottages, for forensic patients. ( 2013 building condition assessment report, PDF ) More pictures of Cottage 113 can be seen at Flickr. ( 2013 building condition assessment report, PDF ) More pictures of Cottage 114 can be seen at Flickr. ( 2013 building condition assessment report, PDF ) More pictures of Cottage 115 can be seen at Flickr. A one storey Craftsman Bungalow, with a side gable roof and a projecting front gable. 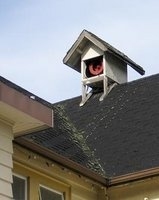 There is an inset entry porch with a shallow arched opening, lapped wooden siding, triangular eave brackets, and half-timbering in the gable end. The plans were signed by Henry Whittaker as Acting Supervising Architect, but drawn and traced by "HJRC", assumed to be H.J. Rous Cullin, a prominent Victoria architect who maintained his own practice before the First World War. 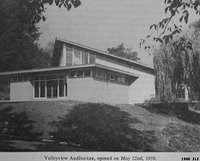 This is one of four identical bungalows built to this plan that still exist; one of the four was built in reverse, as a mirror-image building. In good condition; was used by West Coast Clinical Research. Empty in 2014. ( 2013 building condition assessment report, PDF ) More pictures of Cottage 116 can be seen at Flickr. 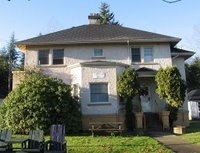 A bungalow identical to Cottage #116. In good condition; was used as the Chairperson P.E.S. residence. Empty, used by movie industry. ( 2013 building condition assessment report, PDF ) More pictures of Cottage 118 can be seen at Flickr. 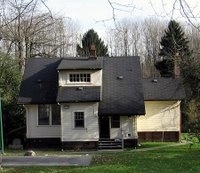 A bungalow identical to Cottage 116, but in reverse. 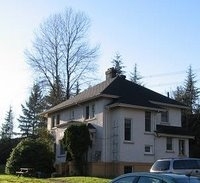 In good condition; was used as Hawthorne Lodge, a residence for out-of-town family members. ( 2013 building condition assessment report, PDF ) More pictures of Cottage 119 can be seen at Flickr. 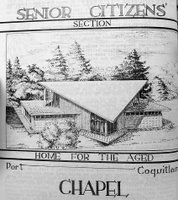 A one storey Craftsman Bungalow, with a side gable roof and a projecting front gable. There is a shed-roofed entry porch with square columns, lapped wooden siding, and half-timbering in the gable end. The plans were signed by Henry Whittaker as Acting Supervising Architect. In good condition; currently used by the Duty Doctor. ( 2013 building condition assessment report, PDF ) More pictures of Cottage 120 can be seen at Flickr. 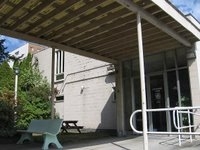 Was used by the, New View Society as a drop in centre. In 2014 empty. 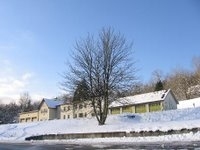 More pictures of Cottage 121 can be seen at Flickr. 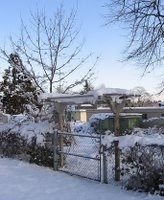 A one storey Craftsman Bungalow, located at the extreme northern edge of the site, close by the cemetery. It features a side gable roof with front gable projections, an inset porch, and triangular eave brackets. In good condition; currently used by Ambulance Services. ( 2013 building condition assessment report, PDF ) More pictures of Cottage 122 can be seen at Flickr. Soccer field, built for BISCO possibly mid 1920s. 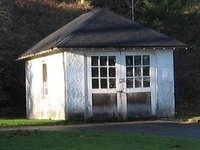 It had a bandstand in one corner at one time, and the upland area above was setup as a picnic area. The Serenity Garden was built as part of the short-lived Horticultural Therapy program. Previously it was run from Finnie's Garden. It has two greenhouses, Storage shed and a washroom. The Nursery was abandoned in 1977. Many of the larger trees and shrubs, were just left to grow wild. Located in the area above the upper road, in this image. The orchards were once quite extensive on the grounds, this one was apparently cut down when they decided to get out of farming, but a few survived and are relished by the wildlife, including the residents. Today a compost pile. At one time the Male Nurses #10-building was here. Started in 1951 as a garden project. Went into some neglect in later years, until concerned citizens decided to rehabilitate the garden, to bring back some of its former glory. A true sanctuary on the grounds for everybody. Click-able MAP of Finnies Garden. Finnie's Garden also has a: BLOG check it out. Not used for games anymore. Riverview Creek, borders the Baseball field, and it has had some rehabilitation done to it. Chum and Coho salmon do spawn in here.